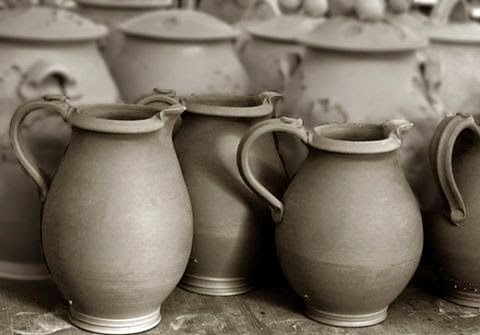 Why do people use pitchers in this day and age (I was asked)? 1. 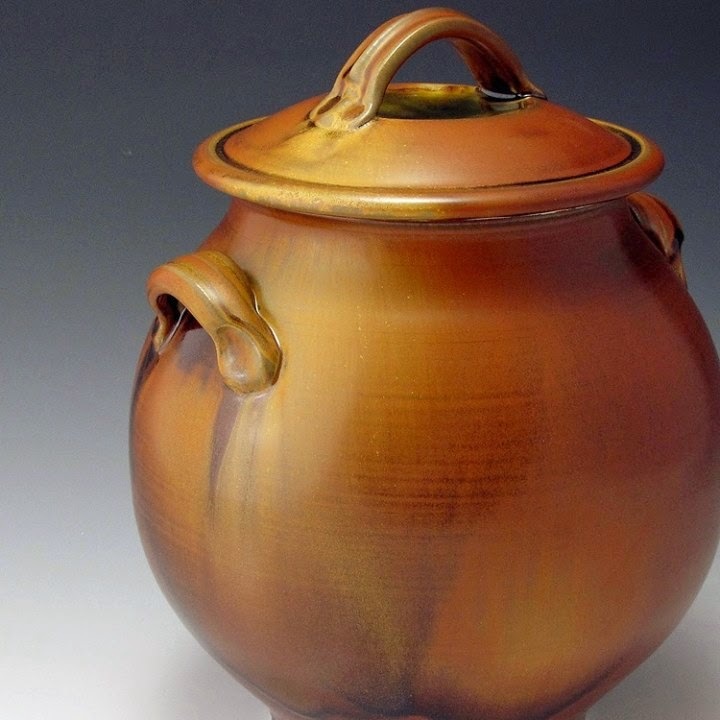 Because good potters keep making them. You know how condiments come in those little plastic packets? ....you try every which way to get them open, frustrated just shy of resorting to getting some scissors....until you finally notice the serrated top that allows you to tear the packet open? Musical 'covers' and pitchers are like those serrated tops. They offer an opening into better and more quickly understanding what we're hearing or looking at (or using). They help make the ambiguous less so. When a musician plays a piece of music with which I'm familiar (a cover), I am given an opening into better understanding where he's going with his own compositions. Pitchers are like google translator. 3. 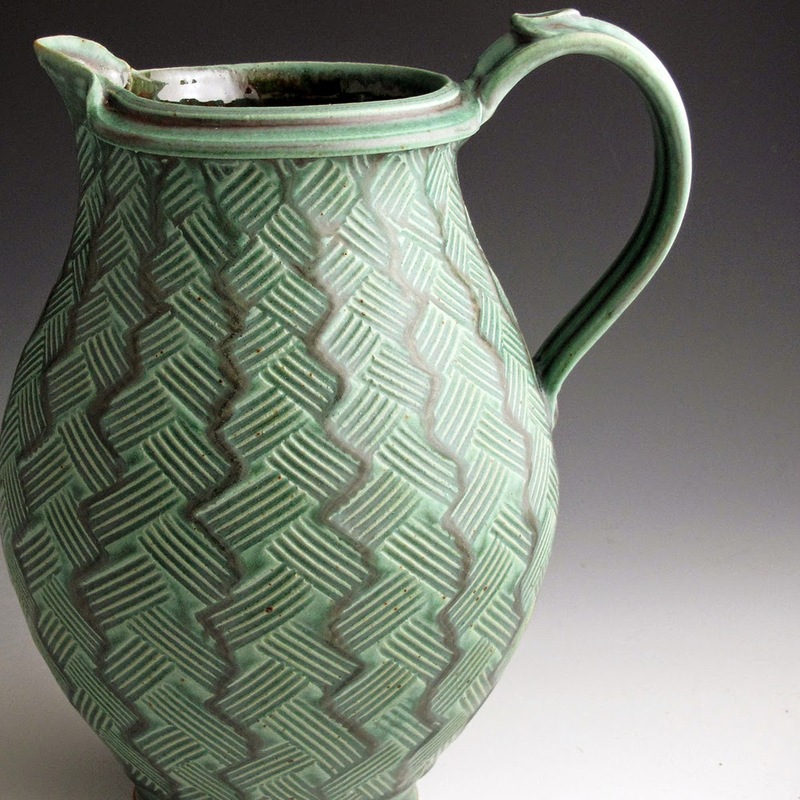 Pottery pitchers elevate the common use of pitchers. Do tupperware or other plastic pitchers serve to function better? Sometimes. Maybe even 'usually'. But if life is going to be reduced to MERE function....as Anthony Newly sang, "Stop the world, I want to get off." 4. 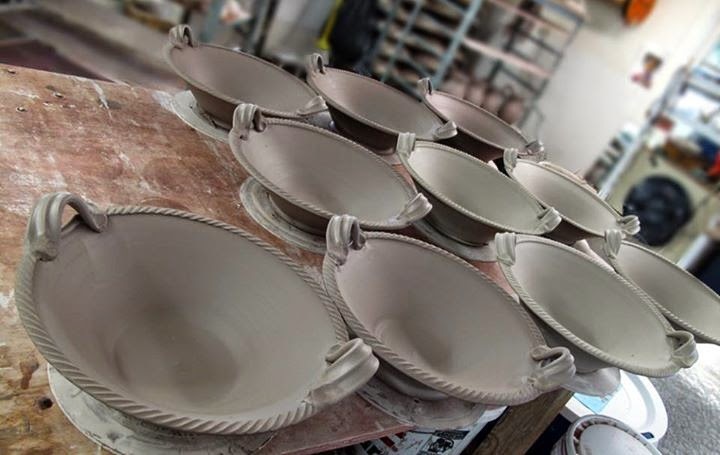 Pitchers are a potter's heritage. It's where we came from. We're post modern folks trying to come to grips with a culture that accepts 'new' as superior. We intuit that that's not right, while simultaneously acknowledging that nostalgia may not be an any better reality. But embracing our heritage ain't no ways nostalgia. It's dues. And it's pleasure. It's humility of the best kind -- grasping the reality of our place in a long continuum, the timeline of which we can hope we aren't even to the mid-point on. 5. Because pitchers are awesome. I was laughing right out loud. And I was doing so before the internet ever even invented LOL-ing. I was paging through the immensely huge "The Potter's Dictionary of Materials and Techniques" by Frank Hamer. I came upon a listing for "Clobbering". 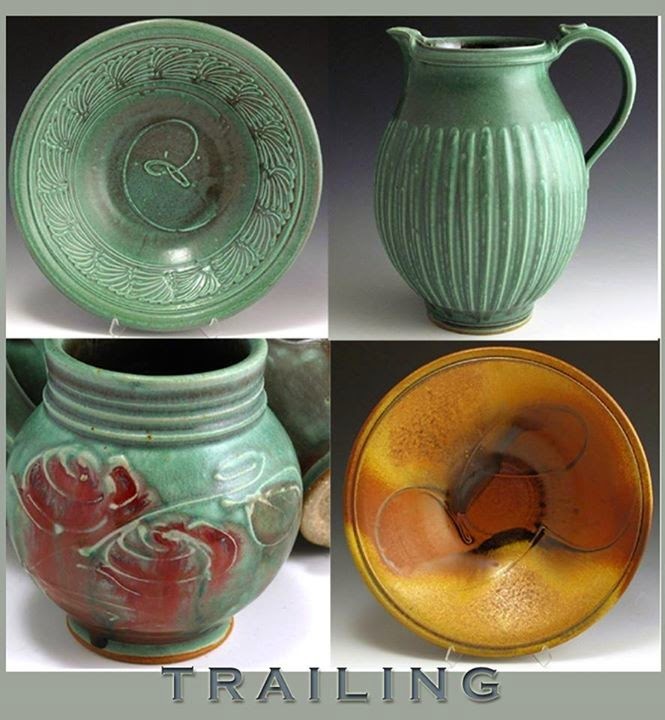 It's a term for over-embellishing pottery in a (vain) attempt to add value to it. Well, here are my TOTALLY UN-clobbered "sunburst" pots. They are (I hope) nothing but simplicity, shape, glow, and function. Inspired in form by my love for the paintings of Bruegel the Elder -- paintings of taverns, dances, weddings, and gatherings -- all with contemporary pottery of the day candidly captured throughout the paintings. And it was all pottery that was so compelling in form, I wanted to reach into the paintings and pull them out and hold them. 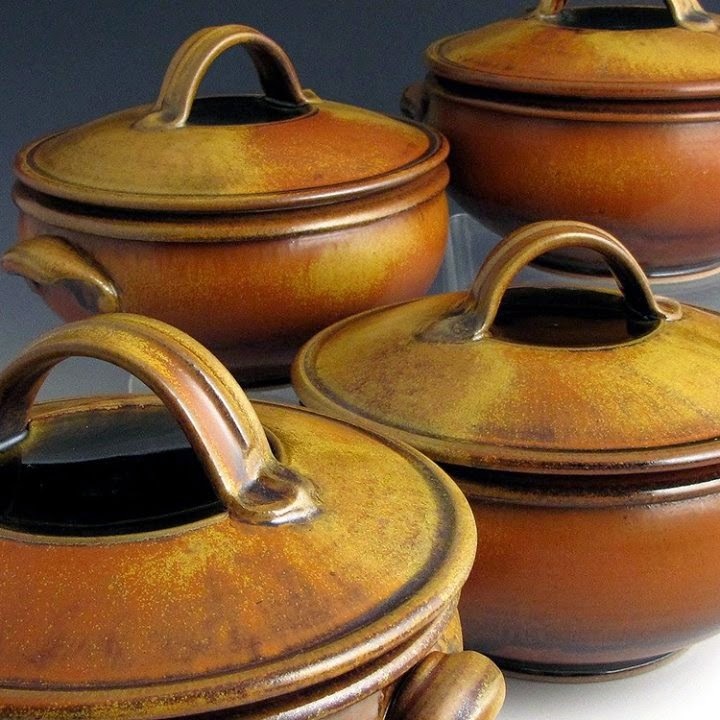 These pots have no embellishment beyond the glow of an iron red glaze and a rutile stain. 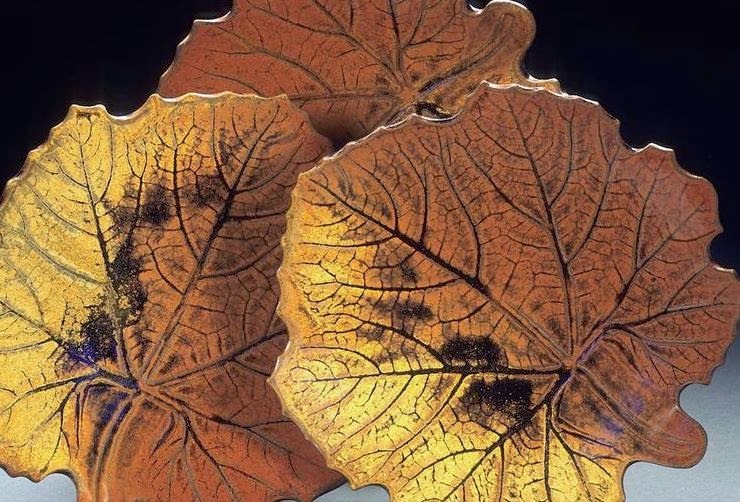 It was my goal to show the beauty of an ungilded lily. 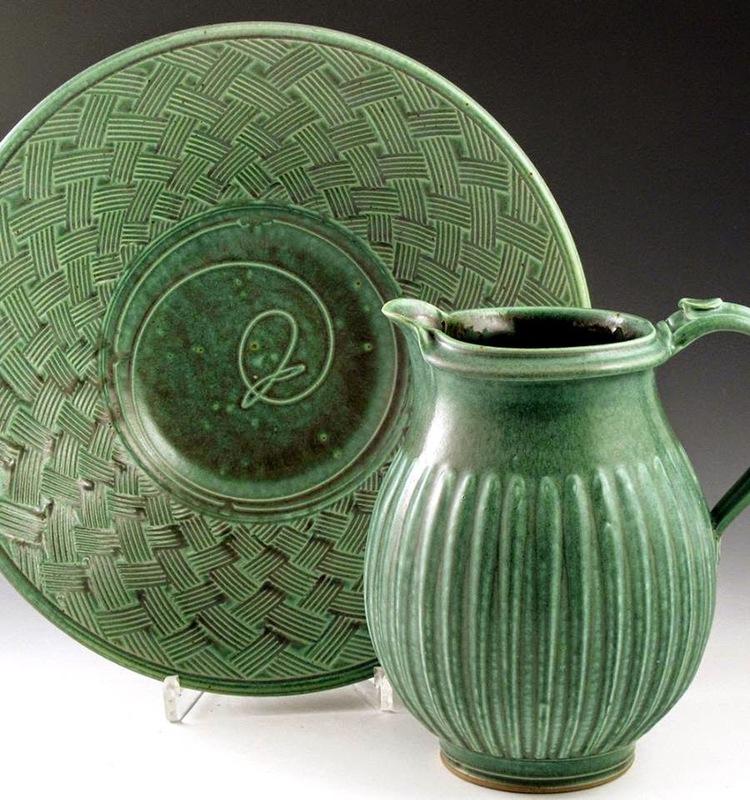 This is day #2 of the pottery image project into which John Tilton nominated me -- the posting of 3 images of (my) pottery for each of the next five days. Yesterday I chose to post the most unadorned (austere? 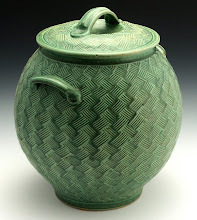 ), least decorated pots that I make. I love working that way. While others may be off exploring the outer edges of the universe of space and color -- the 64 box of Crayolas -- I find that I can still be utterly fascinated by -- and never come to the end of what I can do with just the blue crayon, the red crayon, and the yellow crayon. Still, I figured out early on that the decorating techniques I most enjoyed utilizing were those that added texture and pattern to the surface of the raw clay. Carving, slip-trailing, impressing. I like the immediacy, the pleasure, and the POWER of working with a surface I can still manipulate. Conversely, I never much enjoyed glazing. I have yet to meet the potter who didn't enjoy the stage of naked pottery as much or more than the actual finished piece. And that's certainly true in my case. Since I do work in a manner wherein I decorate the naked surface of the pot, I have the added pleasure around my studio of enjoying a landscape of my own making -- pots with texture galore. 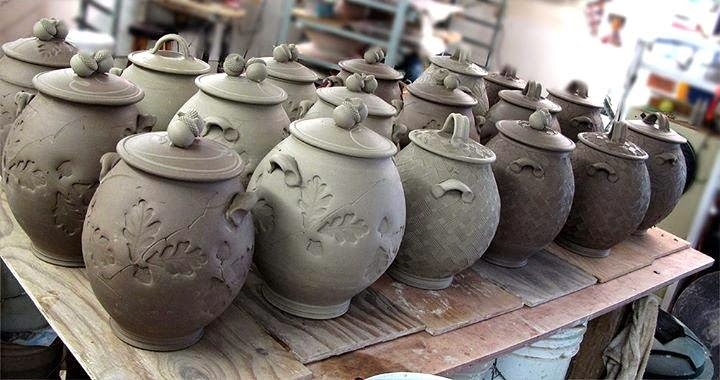 Today I'll post three images of naked pots in process -- a taste of what it's like to step into my shop. Tomorrow I'll post images of how I solved the conundrum created by my love for texturing but my dislike for glazing. 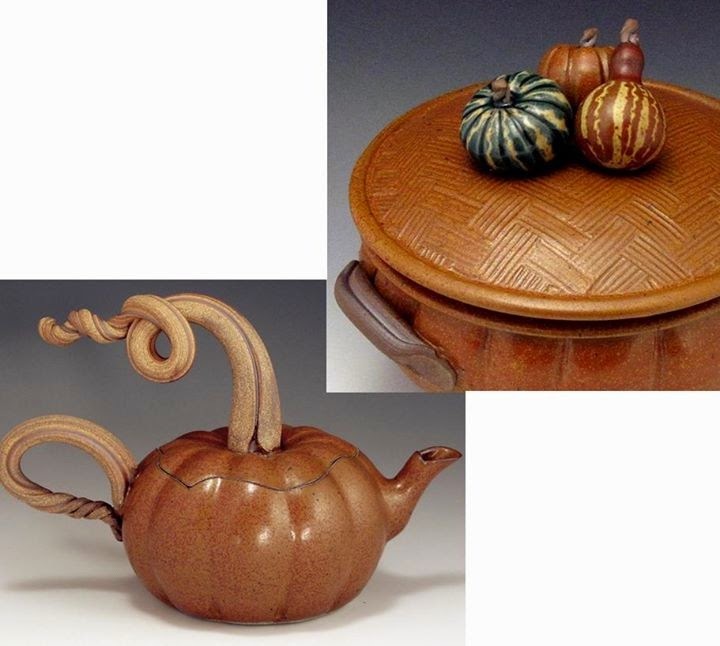 This is day #3 of the pottery image project into which John Tilton nominated me -- the posting of 3 images of (my) pottery for each of the next five days. 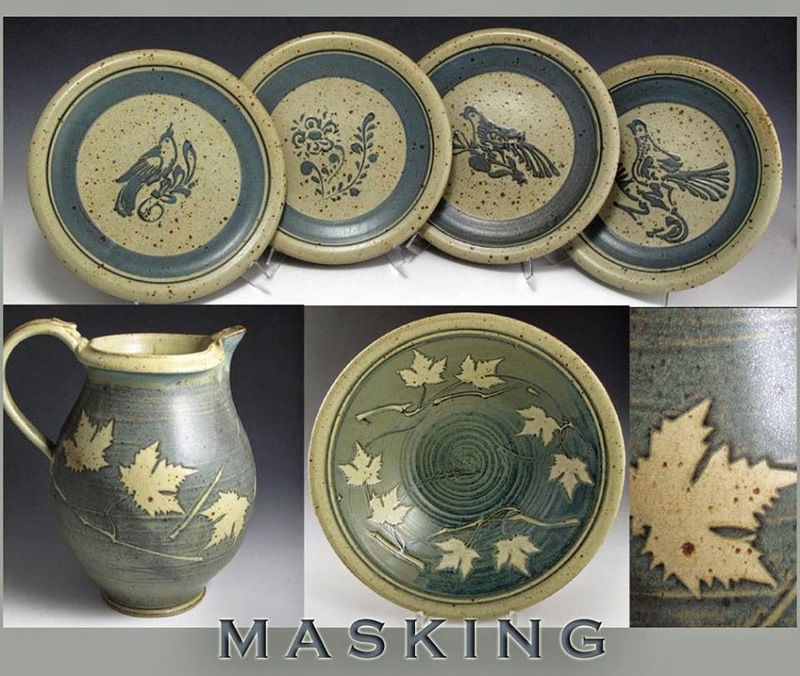 Yesterday I posted naked pots and mentioned that I like decorating with texture -- carving, slip, stamping, etc. That meant that some time ago I had to find or develop glazes that accentuated that texture. Back then I was once set up next to a fellow who did bronze sculpture. 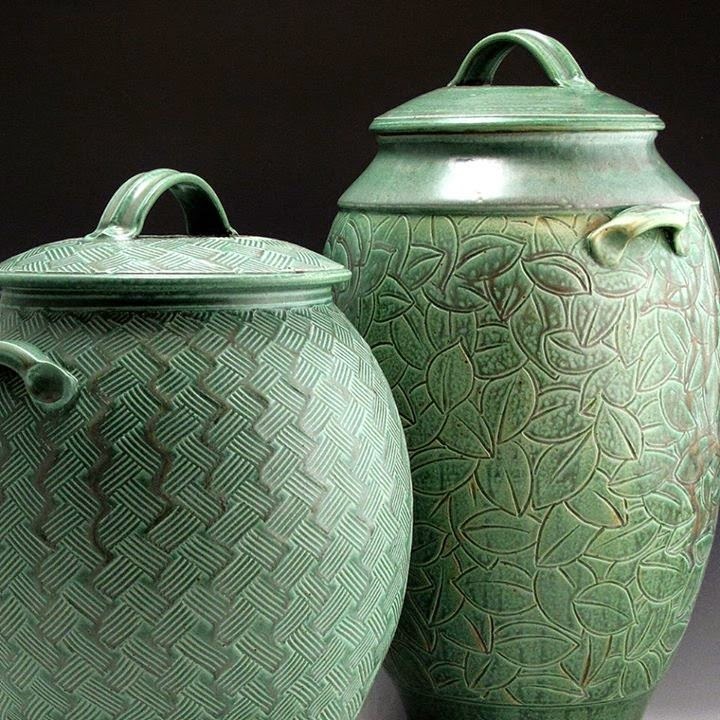 I found myself wishing I could achieve something of that verdigris appearance in a glaze. That would solve the problem of how to make textures stand out AND maintain the appearance of "natural" surfaces I'm always striving toward. I did lots of testing of barium glazes in my quest, thinking that they were the ones that seemed closest to what I was after. 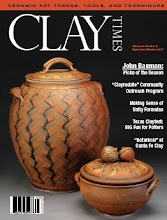 Truth is, though, I really didn't want to think of the problems inherent in producing functional pottery with barium glazes. Besides, in all of my testing, the barium glazes yielded a yellow over the textures. That wasn't what I was after. Then I stumbled upon a glaze that lots of potters were using as a turquoise. It broke to a nice white over texture, didn't contain barium, and added a pleasing dimpled texture to un-carved surfaces. With a bit of tweaking of the chemistry to make the surface a little more "buttery" and the color more in line with what I had in mind, I came up with this. 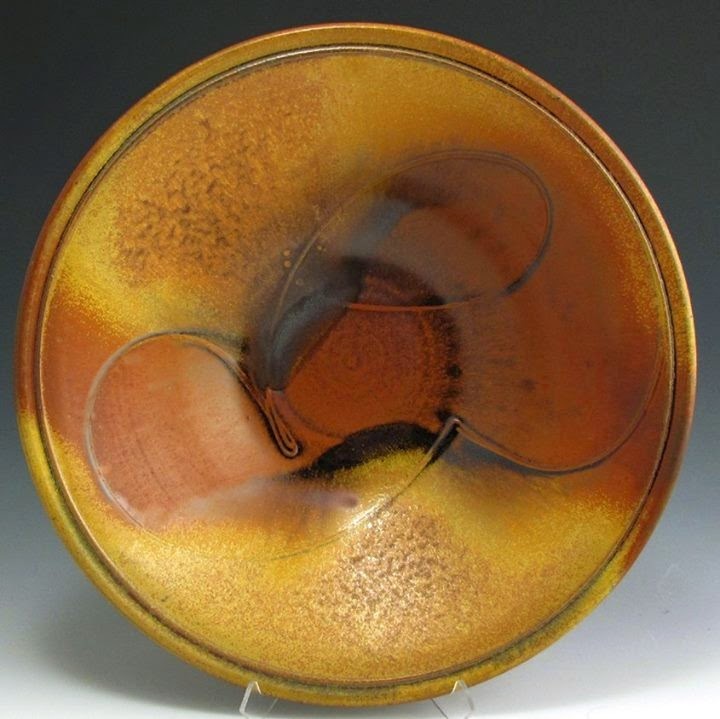 This is day #4 of the pottery image project into which John Tilton nominated me -- the posting of 3 images of (my) pottery for each of the next five days. The first three days I posted images of current work. As a bit of a departure, and by way of something of a retrospective, I'm going to post three postcards I made a few years ago when I found myself exploring ways to evolve the business side of the pottery to adapt to changing times, changing economics, changing capabilities (2000-3000 pots a year is getting harder as I age). I came up with the idea that I could offer up my services as a workshop presenter -- after all, 35 years of doing this might have taught me a few things that others might be interested in learning, right? And while a number of my friends were opening their shops to students, my shop -- fantastic as it is with all the great tools and all -- is just too small to accommodate any more than just me within its walls. Anyway, I advertised myself using the following postcard images. And though I only had one taker for my offer of workshops (and scheduling made even that one not workable) -- I did end up with some images that I like and that somewhat sum up the previous 20 years of my pottery. (yes, 1 or 2 of the images are like what I've already shared). If you find yourself curious about my process with any of the following imaged pots, let me know. I've still got the workshop notes. 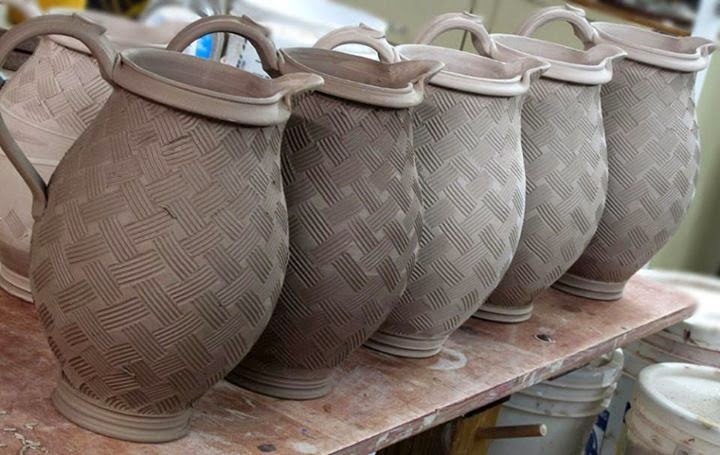 Day 5 of the pottery image sharing. It's been a great project and I'm thankful to John Tilton for getting me to invest the time in doing it. I've been introduced to some great pottery from around the world. 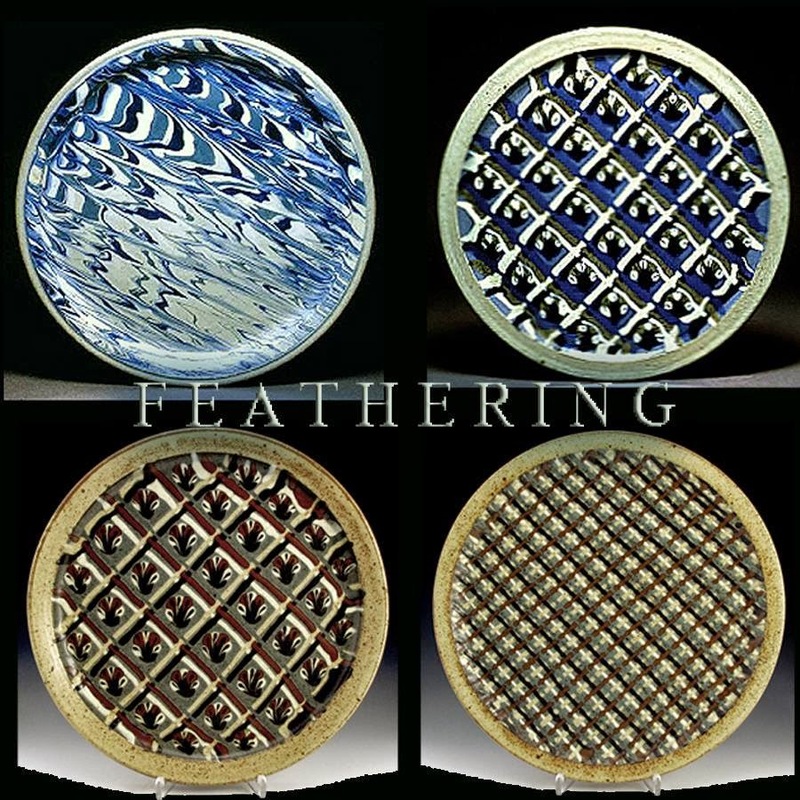 For my final day I'm torn between posting three of my favorite images or posting some things by which many of the folks who buy my pottery identify me. As the latter is something that presumably makes me different, I'll go with those. I noticed something developing in my work around the late '90s. It wasn't a direction I followed by virtue of some big plan. I've never had an aerial view of my life like that. I'm a one-foot-in-front-of-the-other kind of guy. And when I get to where I'm going, sometimes I stop, look around, and say "Oh. So THAT'S how I got here. hmmm." And "how I got here" is that it seems, perhaps due to the amount of time I spend running my dog on woodland trails each day, or the fact that the year I moved to my little acre in the industrial park I started planting trees to surround myself with natural beauty and shade -- whatever the reason -- I have always tended toward glazes and forms that seemed natural. 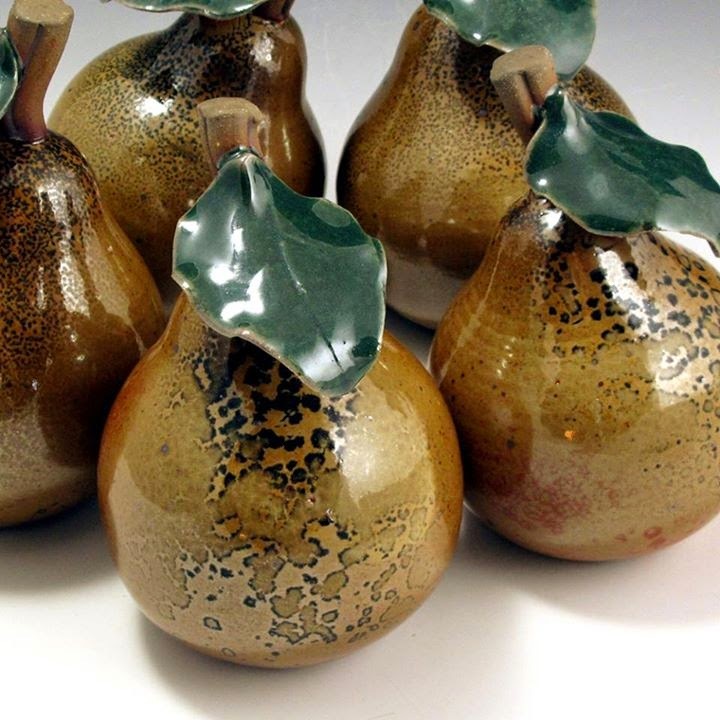 I like glazes that appear to mimic nature. I try for shapes that are timeless. So, here are some of the more literal roads down which I've taken my work.